Product prices and availability are accurate as of 2019-04-20 12:12:29 UTC and are subject to change. Any price and availability information displayed on http://www.amazon.com/ at the time of purchase will apply to the purchase of this product. PT03362 Features: -Roller paint kit. -Interior and exterior painting kit. 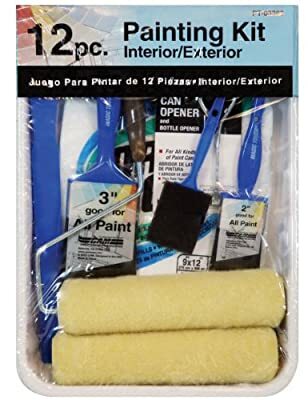 -Kit includes 9'' deluxe roller frame, 2 all purpose roller covers, 3'' wall brush, 2'' trim brush, 2'' foam brush, 9ft x 12ft drop cloth, paint can opener, paint mixing paddles, bright metal tray and 2 plastic tray liners. Dimensions: Overall Length - End to End: -15.38 Inches. Overall Width - Side to Side: -2.5 Inches. Overall Depth - Front to Back: -11 Inches. Overall Product Weight: -2.22 Pounds.